PROC COUNTREG is then used to fit Poisson and negative binomial models to the data. For each model, the PROBCOUNT option computes the probability that the number of published articles is m, for m = 0 to 10. The following statements compute the estimates for Poisson and negative binomial models. The MEAN procedure is then used to compute the average probability of a zero response. 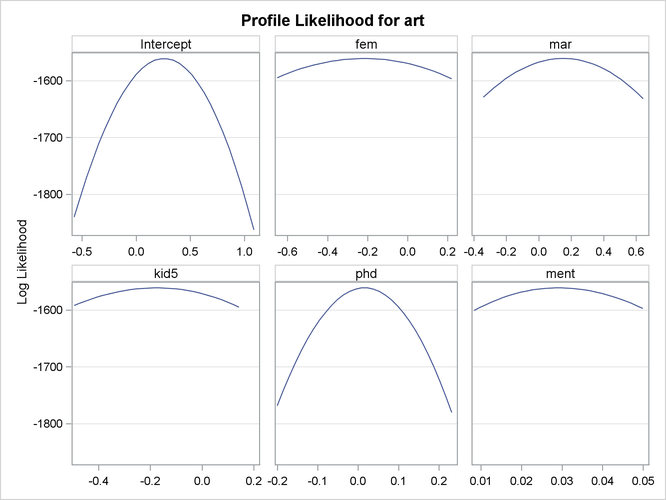 Output 11.2.3 show the profile likelihood functions of the negative binomial model for the Long (1997) data set, in which each model parameter is varied while holding all others fixed at the MLE. This can serve as a diagnostic tool for model performance, because a large number of flat profile likelihood functions indicates poor optimization results and the resulting MLE should be used with caution. Output 11.2.4 shows the results of the preceding statements. Another way to account for the large number of zeros in this data set is to fit a zero-inflated Poisson (ZIP) or a zero-inflated negative binomial (ZINB) model. In the following statements, DIST=ZIP requests the ZIP model. In the ZEROMODEL statement, you can specify the predictors, , for the process that generates the additional zeros. 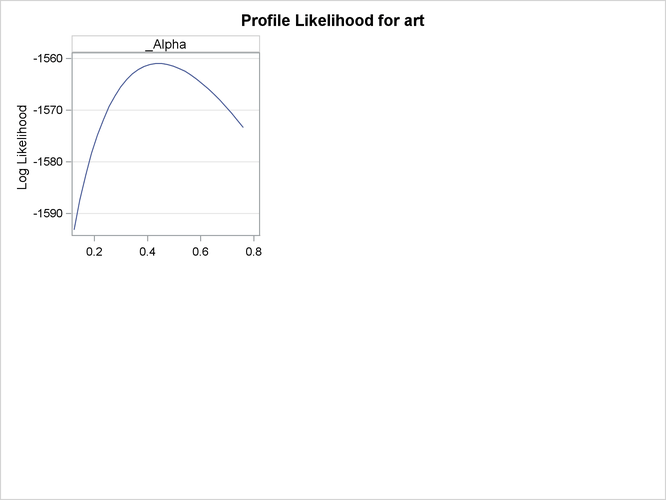 The ZEROMODEL statement also specifies the model for the probability . By default, a logistic model is used for . You can change the default by using the LINK= option. In this particular ZIP model, all variables that are used to model the article counts are also used to model . The parameters of the ZIP model are displayed in Output 11.2.5. The first set of parameters gives the estimates of in the model for the Poisson process mean. Parameters that have the prefix "Inf_" are the estimates of in the logistic model for . The proportion of zeros that are predicted by the ZIP model is 0.2986, which is much closer to the observed proportion than the Poisson model. But Output 11.2.7 shows that both models deviate from the observed proportions at one, two, and three articles. The estimated parameters of the ZINB model are shown in Output 11.2.6. The test for overdispersion again indicates a preference for the negative binomial version of the zero-inflated model ( ). The ZINB model also does a good job of estimating the proportion of zeros (0.3119), and it follows the observed proportions well, though possibly not as well as the negative binomial model. For each of the four fitted models, Output 11.2.7 shows the average predicted count probability for each article count across all scientists. 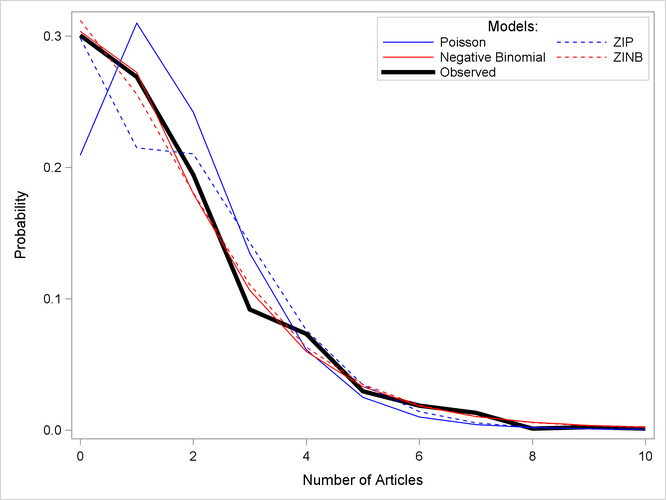 The Poisson model clearly underestimates the proportion of zero articles published, whereas the other three models are quite accurate at zero. All the models do well at the larger numbers of articles.